Western blot analysis of extracts from HCT 116 cells, untreated (-) or treated with neocarzinostatin (NCS 10 μM, 1 hr; +), using Phospho-ATM (Ser1981) (D25E5) Rabbit mAb (upper) and ATM (D2E2) Rabbit mAb #2873 (lower). 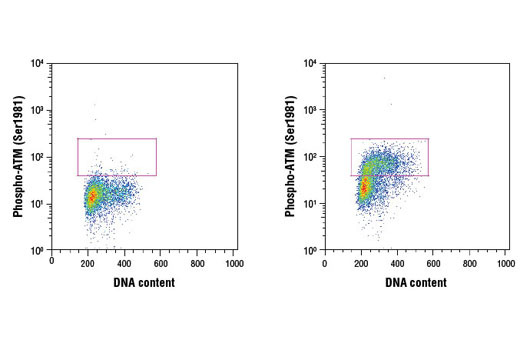 Flow cytometric analysis of HeLa cells, untreated (left) or treated with camptothecin (1 μM, 2 hr; right), using Phospho-ATM (Ser1981) (D25E5) Rabbit mAb and Propidium Iodide (PI)/RNase Staining Solution #4087 to measure DNA content. Anti-rabbit IgG (H+L), F(ab')2 Fragment (Alexa Fluor® 488 Conjugate) #4412 was used as a secondary antibody. 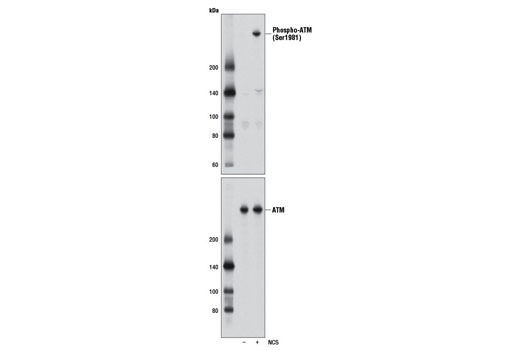 Phospho-ATM (Ser1981) (D25E5) Rabbit mAb recognizes endogenous levels of ATM protein only when phosphorylated at Ser1981. Monoclonal antibody is produced by immunizing animals with a synthetic phosphopeptide corresponding to residues surrounding Ser1981 of human ATM protein.